David Alpher's "Song of Witness," plus two other chamber works, celebrate the the resiliency of the human spirit. Christòpheren Nomura writes: "In 1999, after singing the Terezín Ghetto Requiem, I was approached by a man from the audience – a Holocaust survivor. He was visibly shaken. "Aren't you Japanese?" he asked. "You, a Japanese-American, singing these songs in Latin and Hebrew about people put in camps – do you understand? After what America did to your people, the Japanese, during World War II? Do you get it?" I got it. Then, later that year, I was given the honor to sing for the dedication of the Japanese-American War Memorial in Washington, D.C. These two synchronistic experiences planted the seeds for the making of Song of Witness [by David Alpher], which was debuted in March of 2002. After 9/11, it was my turn to be shaken by the music and words of Stefania de Kenessey and Dana Gioia in Autumn Elegy who both so vividly captured the resiliency of the human spirit. 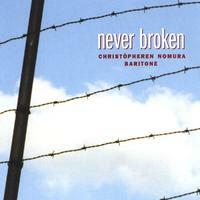 This CD is dedicated to all those who have suffered and have never let their spirit be broken." Christòpheren Nomura (baritone), recognized as one of classical music's "rising stars" by The Wall Street Journal and "faces to watch" by the Boston Globe, is one of America's leading young baritones in opera, recital, chamber music and oratorio. He has performed for U.S. presidents at the White House, significant world leaders including Nelson Mandela and Pope John Paul II, and has traveled worldwide as U.S. Ambassador for the Arts.